New research from Lawrence Berkeley National Laboratory backs up earlier findings. For the past few years, Berkeley Lab has been collecting data on the value of homes with solar photovoltaics compared to those without PV. Early studies relied on modeling and found that buyers were willing to pay an average of $15,000 more for a home with a solar PV array. Another study from January, based on survey data, found that homebuyers were also willing to pay a premium for leased systems. 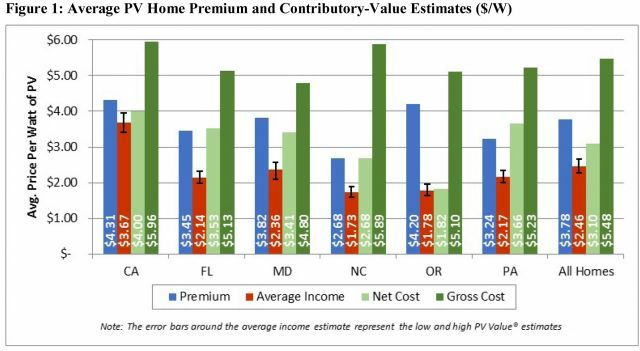 The latest piece of research furthers those findings by assessing appraisals for PV homes in six markets within Oregon, California, North Carolina, Florida, Pennsylvania and Maryland. The appraisal premium ranged from about 3 percent to 6 percent based on the region, with a price boost of about $10,000 to $22,000. The valuations were based upon PV homes compared against comparable non-PV homes by local appraisers. The approach of side-by-side comparison is time-consuming and very specific to each market, and yet, “Many appraisers and lenders prefer the paired-sales valuation techniques that are standard in the real estate community, but comparable pairs of PV and non-PV homes are not always available,” study co-author Sandra Adomatis, an appraiser who helped develop the Appraisal Institute's Green Addendum, said in a statement. For this study, nearly 80 percent of the PV homes that were chosen had to be eliminated because of a variety of factors, such as not being market value transaction, data missing about the transaction or the PV system or no comparable non-PV houses being available. The study, funded in part by the U.S. Department of Energy’s SunShot Initiative, ended up with just 43 pairs of homes to analyze. That makes some findings difficult to parse. In some markets, for instance, homes sold faster with PV, but in others, it took far longer. “There appears to be no clear days-on-market difference in this sample between PV and non-PV homes,” the study found. Even so, the findings are still important for guiding the appraisal industry forward. The very fact that paired-sales valuations are so tough mean that other metrics might have to be considered. 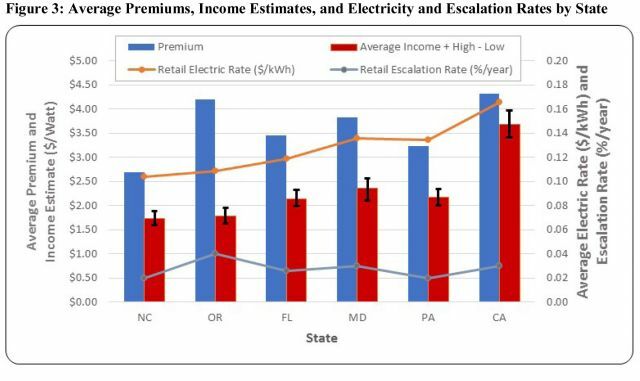 Both the net cost of the system and income estimates of the system were both correlated with the appraisal premiums in all states except Oregon. The value of a PV system should be in dollars per watt, the study asserted, and not as a percentage of the home sale price. Adomatis noted that many in the underwriting and secondary mortgage market think that the income approach overvalues PV, but that approach is likely a conservative estimate. To bring more certainty to the market, better data is needed. That means providing PV system information to a public database, such as the PV Value tool developed at Sandia National Laboratories, which could be used by the real estate market and researchers. On the real estate side, there needs to be ample space in the MLS listing for the solar panel information. That information could live on a sticker inside the electrical box in case a future appraiser or real estate professional needed to access it. Appraisers will also need further education. Only a few hundred have so far taken a course offered on the specific details of appraising solar. 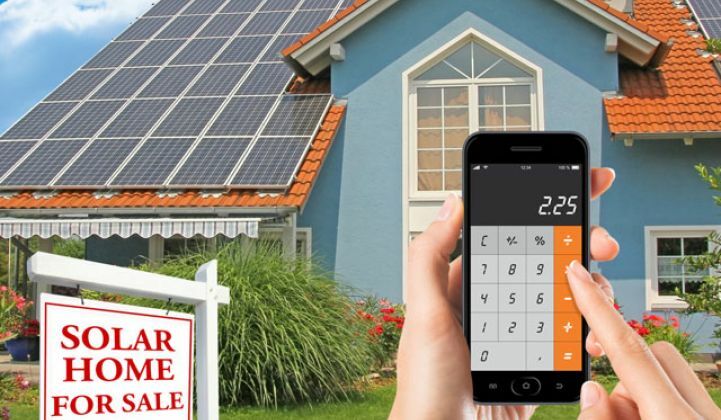 As for homeowners who want to be sure their investment is included in their valuation, for now, the onus is on them to ensure their appraiser is up to speed on the value of solar.